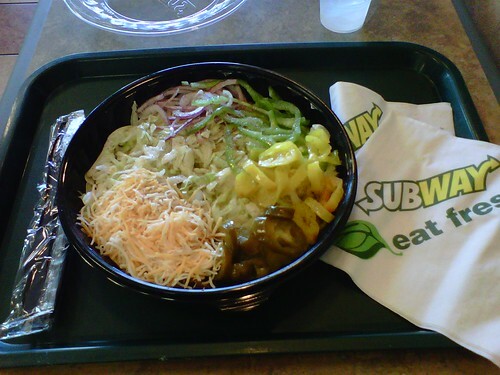 I arrived at the Temecula Subway on Jefferson Road, cross street of Winchester at about 1245pm today. The place was not busy. I was greeted with "hey" by a guy who clearly didn't want to be at work today. I told him I wanted a salad and he did a nice job of making it as I liked. The big issue was when I asked about 'gluten free' salad dressings. The guy who made my salad had no idea what I was asking. He asked if the cashier knew what I was asking. I had figured at a place that talks about healthy food options the staff would know about allergens. I asked the cashier if the manager was available and could help. In spanish the cashier asked the manager, who was even more clueless and grabbed a fat free ranch and said "here". I asked if any manager on duty spoke english and knew what I was asking and was told no, not much. I settled for oil and vinegar as a dressing. Pros: The salad was fresh, cost $3.75, the guy made it ok, the cashier was not to helpful - but very nice. Cons: I couldn't communicate well with the staff in English and the staff had little to NO knowledge of ingredients in menu items or potential allergens. Verdict: food gets an ok from me, the service was average and the employee knowledge gets an epic fail.